We’re all familiar with that most popular of New Year’s resolutions – and the one that is broken most frequently afterwards. While many oversized medieval books look like they enjoyed life to the max, this post is devoted to a relatively rare kind of manuscript that is much slimmer than what you would expect (Fig. 1). “Expect”, because the relative proportions of manuscripts – the width in relation to the height – form a surprisingly stable feature in medieval book production. In fact, the vast majority of surviving manuscripts have the same relative proportions as our modern paper: their width is around 70% of their height. This stability ought to surprise you. While readers of printed books had little choice as to the physical appearance of the object they read, owners of manuscripts handled a book that was made especially for them. Consequently, they would commonly have specified what it should look like. You would think that medieval readers might go overboard and abuse this freedom of choice, ordering polka-dotted books with pink letters written upside down on triangle-shaped pages. The opposite turns out to be true. Book owners before print are predictable in that they mostly opted for regular features: their choices are typical, as if they conform to unwritten rules. This striking act of conformation results from what is a main driving force behind the chosen physical features: the anticipated use of the object. For example, if you anticipated that you would scribble an excessive amount of notes in your book, you would specify to the scribe to extend the size of the margins. And if you knew that you would take a book with you when you left the house, it would make sense to have that copy produced in a suitably small format. This strong link between form and function is good news for us: we may infer that narrow books– sometimes called “holsterbooks” – were put on their diet for good reason. One reason to slim books down had to do with their binding; or more precisely, with its decoration. The most prestigious decorative element of a medieval binding was ivory plaques, slabs of tusk on to which elaborate scenes were cut (Fig. 2). They were attached to both the front and back of the manuscript, usually embedded in the wood of the boards. Book projects that involved this costly decoration commonly produced manuscripts that were much narrower (or taller) than the norm. The plaques themselves had to be narrow given the limited width of the tusk. Interestingly, however, manuscript makers appear to have preferred the book to be equally narrow. This was probably done for visual reasons: it looks better when the relative proportions of book and decoration are in sync. 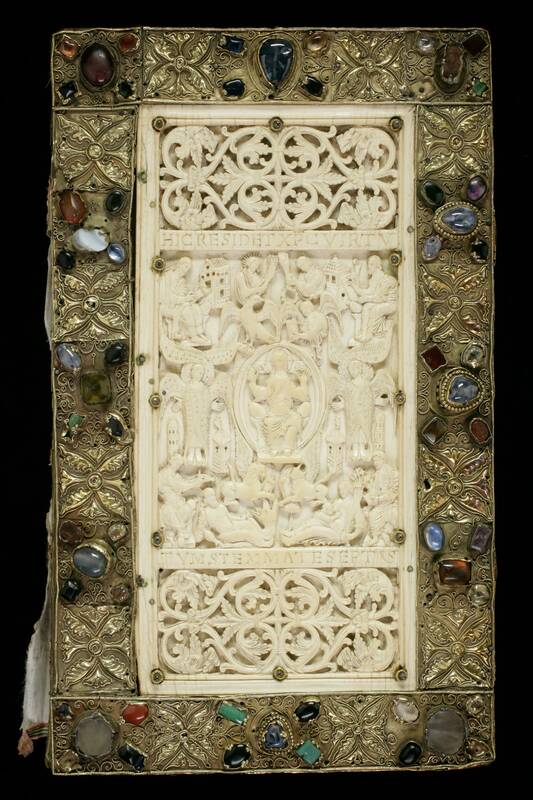 Moreover, keeping the book slim meant that more visible space was covered with ivory. This tendency to keep a book narrow when ivory decoration was added is mentioned in a remarkable account by the historian Ekkehart of St Gall (d. 1022). Referring to what is now St Gall, Stiftsbibliothek, MS 53 (Fig. 3) he states that this manuscript was made tall and narrow for good reason. 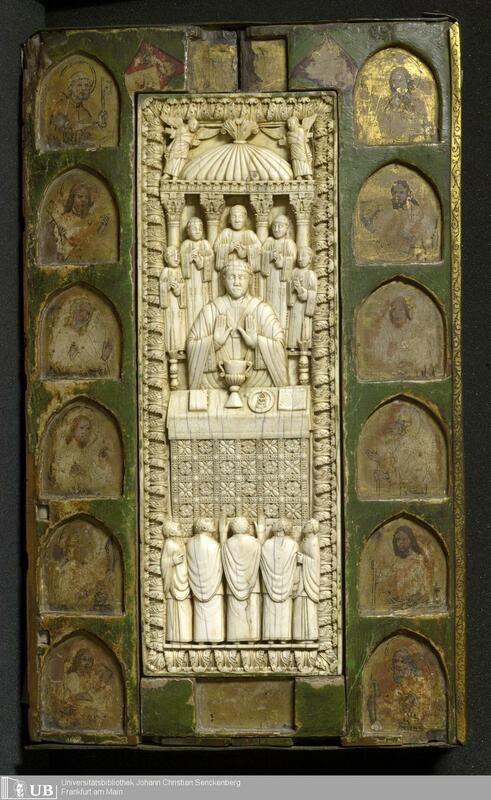 Among the abbey’s treasures, he reports in his chronicle, were two ivory plaques. They once belonged to emperor Charlemagne (d. 814), who used them as a wax tablet, which he kept next to his bed. When it was decided in St Gall that the plaques would be used to decorate the bookbinding of a newly produced Gospel Book, the scribe was asked to design the book in such a way “that it matched the shape of the ivory”. Interestingly, Ekkehart noticed that it was narrower than usual, because he addresses MS 53 as “our tall Gospel Book”. A second reason to produce a slim book in medieval times is pragmatic rather than artistic. When one examines what these oddly tall manuscripts contain, as I did in a journal article published in 2012 (details here), it turns out that a fair number consist of texts that were sung by soloists during the church service. Take the Cantatorium and the Troper, two frequently-used musical books. When one limits the view to the period before 1200, as I usually do in my scholarly work, it turns out that all surviving copies are formatted in the slim format discussed here. Another example is the famous St Gall Hymnal, which is not just very narrow, but also very thin (Fig. 4). It is not given a proper binding, but it is stored in a book box, not many of which survive from medieval times. The reason for these musical books to be designed so awkwardly (in that they break with the norms of medieval book production) is related to how they were used: handheld – literally, as in “while held in one hand”. As I proposed in the article previously mentioned, the effect of the narrow shape was that the weight of the book rested on the palm when it lay open in your hand. This meant that the soloist could easily hold it up for a long period of time. Regularly shaped books, by contrast, executed considerable pressure on the fingertips and the thumb when you held them in one hand. This is not surprising, of course, because they were not designed for holding: they were supposed to rest on a desk or podium while in use. The thinness of the musical books was helpful in this respect, because it greatly reduced their weight, as did leaving off a binding (think St Gall Hymnal). As with the shift in the pressure points, the weight loss helped the reader holding up the book for a long time. While the examples so far focused on the period before 1200, the practice of making slim books is thriving in the later medieval period as well. In the fifteenth century, for example, we see municipal clerks make narrow literary manuscripts, probably conforming to chancery practices. Moreover, there appears to be a real tradition of slender paper books in Middle English literary culture. The Romance of Richard Coeur de Lion in Douce 228, for example, is the slimmest manuscript I know (Fig. 5). It has been argued (here) that this particular manuscript was made for minstrels, in other words that the object was used hand-held. Having read this post, you now know that this makes perfect sense. Across the board, ivory decoration and handheld use are two significant factors in this long tradition of making “slim” books. When faced with a slender book, we can therefore speculate: was its binding perhaps originally fitted with ivory decoration? Or, if this seems unlikely because the parchment and handwriting suggests a cheap production, perhaps it was made for handheld use? As in modern times, diets and weight loss relating to the medieval book speak to deeper motivations. Reblogged this on Books I've Enjoyed (and some I haven't). Reblogged this on Artes Mechanicae. really like your post its so groovy to !!! Went to your lectures in Victoria and I’m so glad I can continue my education via your delightful blog. That’s great, thanks for letting me know. I have a vague memory of reading/hearing that University books had this format so they could be carried in the sleeves of academic gowns. I’ve never found a reference to or evidence it, though, and I guess that if it’s true then it must be from a later date. I don’t know if anyone else has come across that or if I’m making it up! This is the first time I hear this suggested relation between form (narrow) and function (carried on the body, more particularly in a sleeve). It is appealing, especially since the study that I linked to in the blog, and another forthcoming, show that “holterbooks” are often thin (many are made of fewer than 6 quires) and without a binding, so light, bendable and “stuffable”. Thanks for this comment! After your recent lecture in Leeuwarden that I attended with much pleasure I follow your blog with ever growing intensity. This time I must ask you to clarify your description ‘no binding’ as you explain the St Gall Hymnal to us readers. Both of the two signatures (quires) are attachted to their wooden boxes with a thread that can be seen in the center fold of pages 4-5 and 24-25. The three stitch binding is known as a pamphlet binding (cahier steek in Dutch). So the booklets are bound allright, but they are missing a regular form of medieval boards to enclose the content. No boards, no binding? I haven’t had a chance to examine the facsimile yet, but usually such “boxed” manuscripts have quires that are connected to each other (so threads are visible), yet there is no connection between the bookblock (bound-together quires) and the box – otherwise the book could not be removed from it and used. By the way, some “boardless” books do have a binding: a limp binding, which a folded piece of leather – as you likely know. In my experience, the oblong format is also frequently seen among literary commentaries, e.g. clm 15962 (commentaries on Horace, saec. xii/xiii). Do you have a suggestion about the function of the shape? 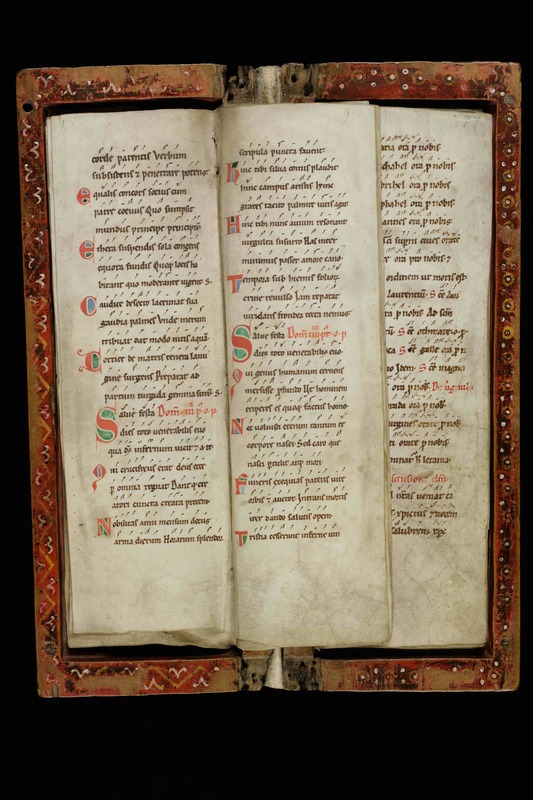 The literary commentary as independant manuscript (i.e. not as glosses in the margins of the text commented upon) really takes off in the 12th century, and I wonder whether the oblong format might render the commentary manuscript a sort of surrogate margin – I mean, a very narrow manuscript (a similar example is vat. lat. 2912 saec. xii ?2/4, which is only 261×131 mm, but with 70 lines in two columns) lying beside the goal text of the commentary might make the impression of the older and more conventional text/commentary layout? Maybe it’s just a function of limited space on medieval reading desks…?